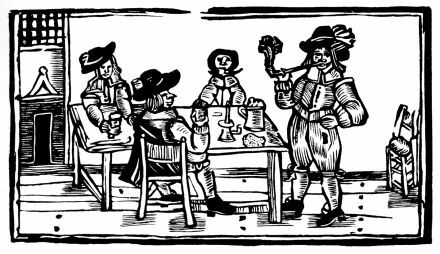 At the beginning of Josephine Preston Peabody’s quaint verse play Marlowe there’s this little scene, in which two groundlings walk in a tavern. One of them comes from the playhouse, where he just saw the new play, Faustus, and is full of the wonders of it. – But what’s a Faustus? Why, it is the man! This man you hear me tell of, in the play! And he it is, doth sell him to the Devil. ‘T is a new play; I saw it yesterday. He sells his soul to the Devil. Of all the arts that ever you shall hear. But yet he will have more! Unto the Devil, and he signs with blood. Ay, you should see it, you! — O Faustus, O! — And what ado in that? By bridge, by water, — horse and heels, to see ? And hear a dismal speech of Faustus, O! — So cuff me, now! ‘T is a brave play. And see that very play this afternoon. What think you strange in that? ‘T is an old tale, — a tale of every day. I never heard it; and the play is brave. Of power and glory; power and power and power! He will have, and he must have, and he will. Doth thy tongue stick at that? He in the play, there is no holding him. But you should see it, you! I did not grudge him, — by the mass, not I! As to put me in a terror! No mention is made here of Ned Alleyn, the bronze-voiced and, by all accounts, very intense original Faustus – but all in all, I think that JPP’s Owen is a perceptive portrayal of the groundlings in Faustus’ day. If you like, you can read the whole play here.